There’s nothing more enjoyable than fresh-squeezed lemonade. Photo courtesy Whole Foods Market. This is Page 3 of a five-page article about the different types of lemons. Click on the black links below to visit other pages. And see many more glossaries of your favorite foods. Greek citron was initially cultivated in the Ionian Islands, leading to the alternative name, Corfu etrog. As a historic note, the fruit was for a long time exported from Greece to be part of the Jewish Succoth ritual. It is believed that Greek citron was in use since the time of the Second Temple* or earlier, and was always used by them for the religious ritual. *From 516 B.C.E. to the destruction of Jerusalem in 70 C.E. by the Romans under Titus. The lower levels of the Western Wall servived and remain today, and the area in front of the Wall has the status of a synagogue. The lemon tree, which has the botanical name Citrus limon, is a small evergreen tree. The fruit is used for primarily for its juice, though the pulp and zest are also used, mainly in cooking and baking. The sour taste from lemon juice comes from citric acid, about 5% in a true lemon. 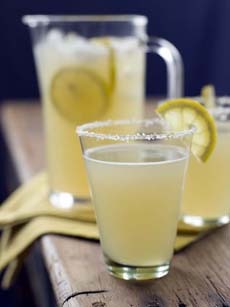 Lemonade is simple to make: squeeze lemon juice into water and sweeten. That being said, there are many varieties—sweetened with sugar, honey, agave or calorie-free sweetener; and garnished with fresh lemon, lime, mint, a strawberry, seasoned sugar and so forth. Here’s an excellent recipe that uses simple syrup, which dissolves easily in cold beverages (unlike sugar). If you want to use agave, honey or a non-caloric sweetener, just skip the sugar steps: (1) Make simple syrup by heating 1 cup sugar and 1 cup water in a small saucepan until the sugar is completely dissolved. (2) Use a juicer to extract the juice from 4 to 6 lemons (total 1 cup of juice). (3) Combine the juice and simple syrup. Add 3 to 4 cups of cold water, to taste. Refrigerate 30 to 40 minutes. Serves 6. Toss cherries, blueberries or other fruit into your lemonade for added flavor and color. Photo courtesy Cherry Marketing Institute. If the lemonade is too sweet for your taste, add more lemon juice. Serve in tall glasses over ice, with a garnish. 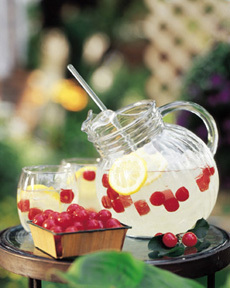 If serving in a clear pitcher, add lemon slices for visual impact. 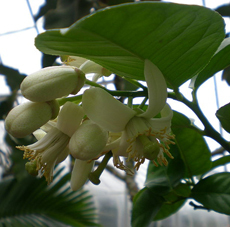 Lemon blossoms are lovely, fragrant flowers that appear on the lemon tree right before the fruit appears. In the photo at right, you can see the nascent lemons appearing among the blossoms. The blossoms are used to decorate cakes and other foods. They are not edible. New lemons peeping out among the lemon blossoms. Photo by Ben Cody | Wikimedia Commons. Juice squeezed from the lemon is used as an ingredient in many recipes. Quartered lemons (or smaller divisions) are used to garnish foods so that the diner can squeeze fresh lemon juice on the food as a condiment. Lemon juice can replace or compliment vinegar in salad dressings; to marinate and tenderize meat, poultry or fish; to make lemonade; and to brighten a cup of tea. The juice and the zest can be used instead of salt in low-sodium cooking. Lemon oil is added to frozen or processed lemon juice to enhance the flavor. It is also used to scent household and personal care items—furniture polishes, detergents, perfume, soap and shampoo, for example. Lemon peel, or peeled lemon rind, includes the yellow rind and the white pith underneath. The peel is is the source of lemon oil, plus two more valuable products: citric acid and pectin. Lemon oil is used as a flavoring for hard candies; it is also cut and candied in sugar syrup to make candied lemon peel, a delicious confection. The peel and the zest are also used as ingredients in confectionery and baked goods. Fresh lemon peel is served as a garnish for espresso: Rub the pith around the rim of the cup to release the lemon oil, which adds to the flavor of the drink. The yellow skin of the lemon, without the pith. It is most often zested. See lemon zest, below. Lemon zest, or the grated rind, is the skin of the lemon, the top layer of the rind without any of the white pitch. Lemon zest is a popular flavoring for baked goods and desserts as well as in savory dishes, such as meats and sauces. The rind holds the lemon oil, and adds exciting taste. After you’ve squeezed a lemon for its juice, don’t toss it out; zest it and use the zest in anything from vinaigrette to vegetables. Here’s how to zest a lemon. 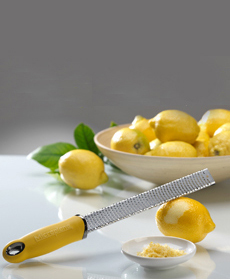 It’s easy to zest a lemon with a microplane. Photo courtesy Microplane.com. 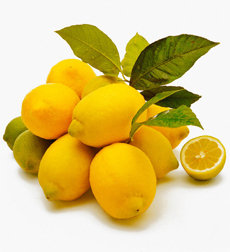 The Lisbon lemon has a smoother, thinner skin than the Eureka. Lisbon lemons. Photo courtesy CitrusTreesOnline.com. The stem end of the Lisbon does not have a neck, the blossom end (opposite to the stem end) tapers to a slight point. The Eureka has a short neck at the stem end. The Lisbon bears two crops a year; the Eureka can fruit nonstop. What makes the Eureka more popular: it has no thorns. The Lisbon is a thorny tree; thorns make it more difficult to pick the fruit. Finally, the Lisbon does better in slightly cooler climates than the Eureka, which likes consistent warm weather. The head writer played by Tina Fey in her hit series, 30 Rock. This doesn’t really belong in a lemon glossary, but we love you, Liz Lemon. Some information courtesy Purdue University. Copyright 2005- Lifestyle Direct, Inc. All rights reserved. Images are the copyright of their respective owners.